We spend a lot of time watching what’s hot on GitHub so you don’t have to. But even our crack team of open source fans can’t watch everything. Chances are, we’ll never cover much Ada or Nu. 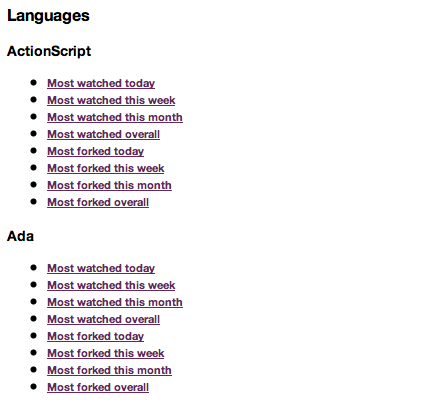 Fear not, Oscar Del Ben, of Rawler fame has made it easy to track trending repos for your favorite GitHub languages. GitHub Trends is a nice way to subscribe to feeds tracking the most watched and most forked projects broken out by day, week, and month. One thing we’d like to see is an OPML for each language (and maybe overall) to subscibe to feeds in one shot. Maybe I should fork the project and add it myself? Update: Nate has added OPML support.